To confirm the hypothesis, we now decided to remove more of the gravel, working very slowly and horizontally. And this proved to be successful: Despite the difficulties recognizing any structures in this massive pebble layer, we managed to trace remains of a new mudbrick structure – a small section of a wall running more or less North-South (to the left in the picture below) and some scarce remains further to the East (to the right in the picture). 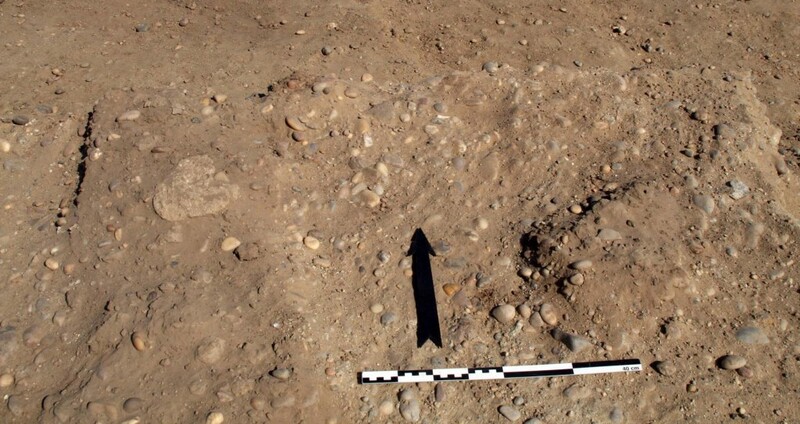 Although just a few centimetres are preserved, this almost lost new feature 18 confirms again early Pharaonic occupation in SAV1E: ceramics associated with it are predominantly (71 %) datable to the early 18th Dynasty; especially relevant is one fragment of a beer jar, still sticking to the remains of what was once a mudbrick. This entry was posted in 18th Dynasty, Archaeology, Settlement architecture and tagged Brick architecture, Sai Island, Settlement archaeology by Julia Budka. Bookmark the permalink.